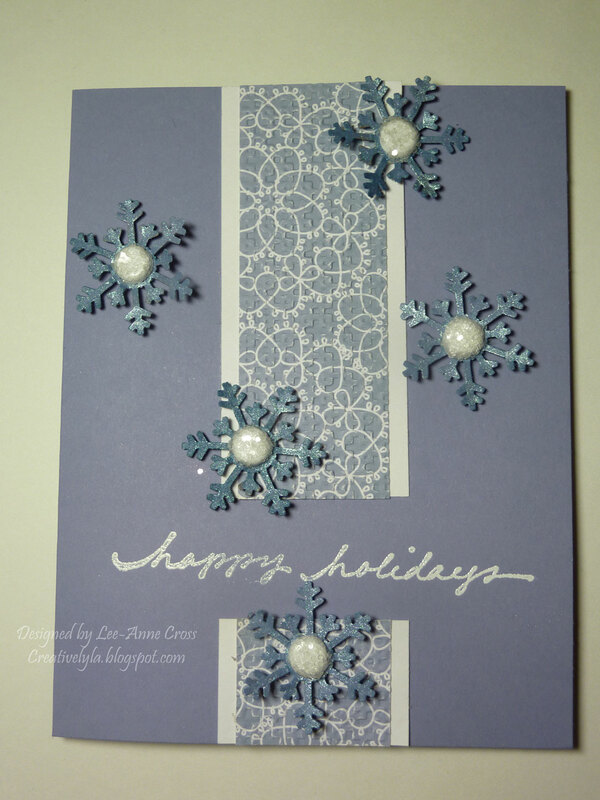 Over at Splitcoast today, we honoring snowmanqueen and our Free For All Challenge is dry embossing. I’ve cased one of Carolyn’s beautiful cards but changed it to a winter theme complete with Wisteria Wonder snowflakes. My card base is a standard A2 in Wisteria Wonder. Next I took a 1 1/2″ strip of Whisper White, split it, and placed it down the middle of the card. Then I took a 1″ strip of designer paper and ran it through an embossing folder to give it some texture before placing it on the card. I punched five snowflakes in the same card stock and sprayed them with Glimmer Mist. Next I took white brads, dipped them in Crystal Effects and then dipped them a chunky white glitter. After piercing a hole in the center of each snowflake, I took my button shank remover and snipped off the brads so that they wouldn’t show behind the snowflakes. The sentiment has been stamped and embossed in white. And that makes one more card for my Christmas stash…YEAH!